Few guitar players and guitar builders have enjoyed as long and as successful relationship as that which exists between Carlos Santana and Paul Reed Smith Guitars. The two icons are forever linked in the minds of much of the guitar-buying public, and each compliments the other in many profound ways. 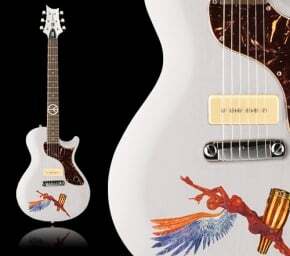 To celebrate this long-standing partnership, PRS is producing a limited run of Carlos Santana Abraxas SE guitars. The guitars are based on the SE One model, and feature a single cutaway mahogany body, a mahogany neck built to a 25” scale length, a rosewood fingerboard with 22 frets, a single soapbar pickup, and a stop tailpiece. The guitars are finished in whitewash, have a graphic from Santana’s Abraxas album on the body, and also have a peace sign inlaid at the 12th fret. The Abraxas SE is built with typical PRS quality and attention to detail. Fit and finish are excellent, it balances well on the shoulder, and the Wide Fat neck plays like a dream. The electronics are as simple as it gets: one pickup and a single volume knob. The Abraxas does a great job of channeling vintage LP-Junior-type tones (with some PRS smoothness mixed in) and is a major gas to play. It takes its name from Santana’s second album, Abraxas, which combines familiar rock guitar sounds with Latin influences and is considered by many to be Santana’s definitive work. Being an SE, the Abraxas will be affordable to many (check your local PRS dealer for pricing) and that is a large part of the fun it generates. It truly captures Santana’s vibe and spirit and is a great choice for anyone looking for an affordable, individual, and, due to it being a limited edition, probably collectible new guitar. Check for hot buys.